"I would like to express my sincere thanks for your contribution to the effective education conference held in May...the conference was very successful and this was due to the quality and wide range of your presentations and workshops..."
John Griffiths, Deputy Minister for Skills, Welsh Assembly Government. "Simply brilliant INSET day!. We've got so many useful ways foward"
"Many thanks for an interesting and thought provoking course- I wish all of the courses I attend were as motivating!" Jane Love, Deputy Head, Ysgol Pen Y Bryn, Colwyn Bay, Wales. "Your workshop inspired me to take ideas back to use with my students. I really liked the way you mix the big concepts with tools to use in class. Thank you"
Adrian Rennie, Deputy Principal, Northcote School, Christchurch, New Zealand. "An excellent day, thought provoking and inspirational. I'd like to drive HOM forward in Wrexham"
Nigel Davies, Advisor, Wrexham LA, Wales. "Refreshing to have INSET from someone who is still teaching! A very positive experience to learn how to apply higher thinking skills and Habits of Mind to teaching." Lesley Cook, Deputy Headteacher, Garden International School, Kuala Lumpur, Malaysia. "Having never covered anything like this in my career, I was very pleased to have some concrete terms and exercises to refer to. I feel that it will greatly improve my teaching as well as help me as a manager"
Teacher, Garden International School, Kuala Lumpur, Malaysia. "Very relaxed, approachable, confident and an excellent ambassador for learning and teaching..."
Scott Jordan, Hamstead Hall School, Birmingham. "Graham is an adept presenter and facilitator, knowing when to lead, and when to listen"
Liz Worthen, Deputy Director, Programmes, London Gifted and Talented. "Thank you for a fun and active day. The thinker's toolkit proves very popular with the staff and very useful in the classroom"
Clare Magee, Gifted and Talented Co-ordinator, Liwara Catholic Primary School, Perth, Australia. "Thanks so much for your efforts and energy when you were here- all the feedback that I have had was fantastic"
Esther Hill, Teaching and Learning Co-ordinator, Perth Modern School, Australia. Dr Jonathan Allday, Deputy Headteacher, Royal Hospital School, Ipswich, Suffolk. 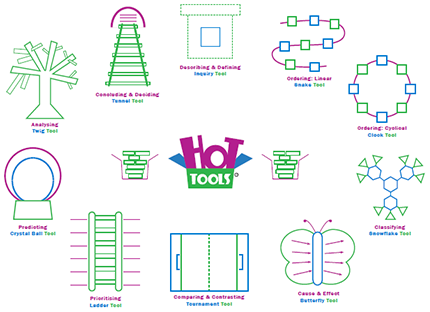 The 10 HOT Tools combine literacy and higher order thinking to improve the quality of thinking, speaking and listening and extended writing. They provide a whole-school language of learning which empower students to demonstrate their potential in class and in exams. HOT Tools CPD is only available at Tomorrow's Learning. Email graham@tomorrowslearning.co.uk to arrange a HOT Tools INSET Day for your staff or writing workshops for your students.